Around the world, wedding rituals vary greatly from culture to culture. While the idea of joining two people in love together in a lasting union is the same, different cultures have their own way of doing so. Marriage is defined as a union, but the various cultures create that union in their own ways. A target registry for wedding can be helpful. In many Western cultures, the bride dons a white dress on her wedding day to demonstrate her purity. Other cultures from across the world signify the same purity, but with a different wedding ceremony tradition. Exploring the various wedding traditions from across the globe gives insight as to how unique each culture is. Learning the traditions of other cultures can help couples soon to be wed in planning their own wedding. However, some wedding traditions from around the world are downright bizarre. Here you will find the most bizarre wedding traditions from around the globe. Crying is often something that is done at weddings. Most cry out of happiness, but that is not always the case in some cultures. In China, the Tujia people prepare themselves for a wedding thirty days in advance. The bride begins crying for one hour a day by herself. On the tenth day, her mother will join her in crying for an hour. Ten days after that, the grandmother will join the bride and her mother in the crying session. This process continues until all of the female family members are crying for one hour a day in unison. The women weep for joy. In Sweden, it is not only tradition for the bride and groom to kiss, but also most of the guests. All of the men that are not married are allowed to kiss the bride while the groom is away. The female guests have the ability to kiss the groom when the bride is not present. 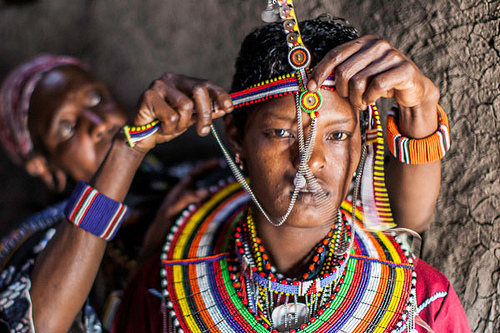 In Kenya, the bride not only shaves her head and applies oil and lamb fat. It is also customary for the father of the bride to spit on her breasts and head. In the Massai tradition, spitting is a sign of good fortune. Once the bride leaves with her husband, she does not look back to her family for this culture believes she will turn to stone. During weddings in Indian culture, a ritual called Kumbh Vivah is performed. It is a spiritual tradition that is believed to prevent the death of one’s partner. Indian culture also believes this ritual will reduce the amount of stress that the couple endures during their years of marriage. In Hindu marriages, the wedding date has to be determined by the stars. As bizarre as this sounds, it is a tradition that is still followed to this day. An astrologist works with the bride and groom during a process called muhurta. Before Hindu marriage ceremonies, there is a huge party thrown called a sangeet. This party takes place days before the wedding ceremony. In South Korea, an odd wedding ceremony tradition is to beat the feet of the groom. Friends of the groom remove his shoes and tie his feet together. The group then picks the groom up off the ground and begin beating his feet with sticks and a kind of fish called yellow corvina. The lighting of unity candles in Western culture has become extremely popular. Some people prefer a more unique route and desire unity candle alternatives. Some of the most creative alternatives to unity candles include sand wedding ceremonies. This is where the bride and groom pour sand into a bottle to signify their unity. Other options include the mixing together of two types of wine. These non-traditional ceremony ideas can help add a bit of flair to your wedding day. A unity tree wedding is another idea. You can gather ideas from other cultures to incorporate them into your wedding day. Family unity wedding ceremonies often involve more than just the bride and groom. This tradition, along with other Christian wedding traditions, create a bond between the two families that have been joined together. These ceremonies often include any previous children the couple may have had before they were married. The wedding rope ceremony is often found in Catholic religions and signify the joining of the couple for life. In India, ghosts are believed to inhabit some people in the living world. And women that have abnormalities or thought to be cursed can be considered to be inhabited by ghosts. Indian cultures believe that the only way to rid the women of the ghosts is to have them marry an animal. This is more of a symbolic wedding than anything. The ceremony is said to exorcise the ghosts out so that the happy couple can live in peace once they start their life together. In parts of Sweden, it is a tradition for the friends of the bride to kidnap her, so to speak. The friends take the bride and blacken her. The blackening of the bride can consist of things like tar and feathers or it can be other things such as spoiled milk. Sometimes flour and soot are used. This tradition is to ward off evil spirits from causing harm to the couple throughout their marriage. 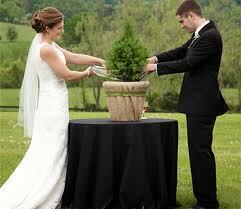 All in all, wedding rituals vary from country to country. The union of a couple in love can be done in so many different ways. Each wedding tradition is sacred and important to the culture that celebrates it.